Otaku culture is enjoyed globally by many in all corners of the world. The International Otaku Expo Association (IOEA) will be an assembly of events and expositions where those who love otaku culture congregate. Today, Otaku culture fans are everywhere and they form local communities in their own respective regions. The existence of numerous Otaku expositions around the world is testimony to this. Every year, there are over 1000 Otaku culture related events and expos taking place in the world. Their combined number of participants is over 20 million!! 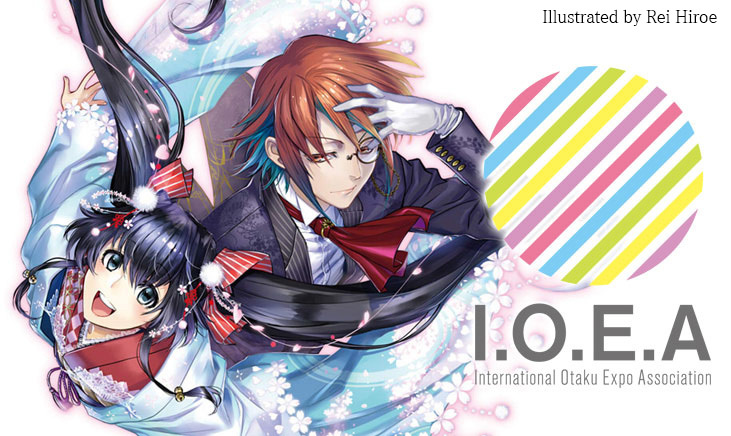 The IOEA（International Otaku Expo Assosiation) will link these events and expos. By linking these types of events and expos, expo operators, fans, and creators together, private and public entities will be able to expand the scope of their various activities, all in an effort to foster friendship among enthusiasts of otaku culture around the world. The goal of the IOEA is to usher in new development within the otaku culture through helping enthusiasts of otaku culture form deeper relationships. The IOEA believes these developments will help create a new world where it will be possible for fans to share higher degrees of experiences of happiness. Please look forward to the IOEA!